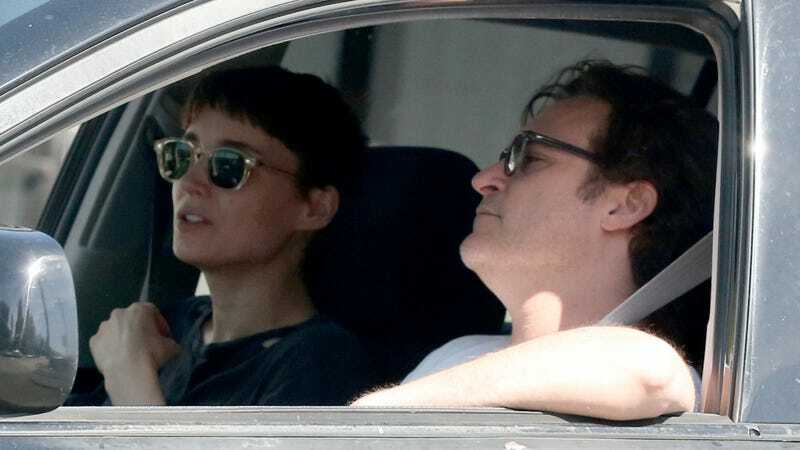 After falling in love while filming Mary Magdalene, an upcoming movie about one of history’s most iconic and smoldering unconsummated romances, Mary (Rooney Mara) and Jesus (Joaquin Phoenix) are now living together “in the Hollywood Hills,” roughly 6600 miles from where they met, in Nazareth. Oh, excuse me, Mary Magdalene was filmed in Italy. Phoenix’s life is remarkably simple compared to what people might imagine. He lives with Mara in the Hollywood Hills (he’s never been married and has no children) and is usually asleep by 9 p.m. and up at 6. When he’s not working his daily routine consists of answering emails, ‘‘chilling’’ with his dog, meditating, taking a karate class, eating lunch, reading scripts and dinner — but for most of last year he’d been on location. But I’m going to stop myself here before spending 1000 words on how much I love those photos of Rooney Mara taking a long drag behind the crucified body of Jesus Christ. The best part of the T profile was this bit about what Phoenix and Mara watch on Netflix. An excerpt from Anna Faris’s upcoming book was published in the latest issue of Cosmopolitan and I would like you to read part of it. I was once told that I didn’t need a tight group of girlfriends because Chris [Pratt] should be my best friend. But I never bought that. The idea of your mate being your best friend — it’s overhyped. I really believe that your partner serves one purpose and each friend serves another. Though she doesn’t really seem like the type who’d enjoy spilling tea about their exes (regardless of how angry she may or may not be with him) I expect to find plenty of small and revealing quotes like this one in her book.